Weekly picture archive at Fabisch Fly Fishing, part one of 2015. Here ten collected pictures from the areas fly fishing, fly tying and nature. The pictures were taken in Europe as well as North America including Canada. So far it is hardly noticeable, but it's already been three weeks since the darkest time of the year. Now we keep getting a little more light every day. To me, the way out of the dark into the light starts every year on December 21st (ok, 22nd in 2014). So, this is a piece of motivation for good feelings and positive thinking. Like thinking about the fishing trips this new year will bring us. Whether you are looking forward to Canada, Slovenia, Bavaria or anywhere else. We'll just have to sleep a few more nights and we'll be on the road again to beautiful fly fishing venues. Let's enjoy being able to look forward to great places and great events. Only us lucky guys in the Northern Hemisphere, that is. You poor people on the Southern Hemisphere are going to lose a little daylight every day. January, over here, is considered a rather quiet time of the year. It is too early to cut trees along the river, particularly so this year, because the soil is drenched with rainwater and a tractor used to pull felled trees would cause too much damage to the pastures. The picture shows the Wiesent Valley between Christmas and New Year's Eve 2014. At the time the picure was taken, however, the temperature was -9°C ( 16°F ) and the ground was frozen solid. Current temperatures would fit mid-March better. Most of the brown trout will have finished spawning by now or will be going through the last throes of mating season. River keepers should be very careful when placing Whitlock Vibert Boxes in the river to avoid stepping on on any redds. Of course, hatchlings produced naturally by wild trout without human help have priority. Let's look forward to the new season. I don't grab it! 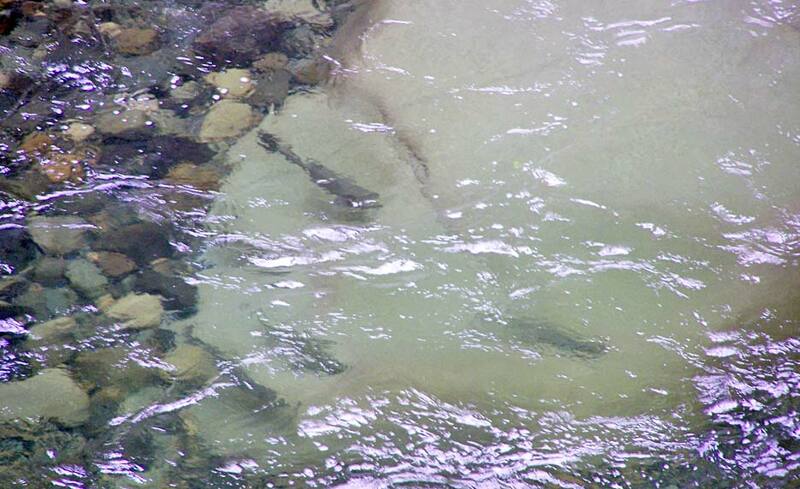 I took this picture in 2008 in Canada on the Coquihalla-River. Back home I cut out some sections and used it on my site for the Coquihalla. Many times I modified the site, adding new information, and I never even noticed it. This holds true for the German as well as the English version. When working on the site again a few days ago, I stopped short and thought: now this just can't be true! The light rock on the bottom with its cracks, but particularly with the steelhead hovering above, clearly shows a human face! It is hard to believe how many times one can look at a picture and overlook such obvious patterns. It's just about getting time to start thinking about your big flyfishing trip for 2015. Even ten days in Naturns near Meran (Province Alto Adige, Italy) can be a great vacation. You have the rivers Etsch (Adige) and Passer (Passirio) at your disposal and fishing in rivers that might yield one of the famous Marble Trout (Marmorata - salmo trutta marmoratus) any day sounds interesting, doesn't it? 25 years ago I used to fish the area frequently, but in those times you didn't need a new permit for every other 2 kms. But then there are the long-distance fishing trips. You could, for instance, hop on a plane to Vancouver / Canada, say on September 22nd or 23rd. Once you've gone through immigration and customs all you have left is walking about 200 meters to the car rental counter, and you can start your big Steelhead fly fishing adventure vacation. Enjoy! The Lillach is a little creek only a few kilometers long in Franconian Switzerland, a region in Northern Bavaria named for its scenic rock formations. The Lillach valley is a natural monument but nevertheless at times, especially on weekends, pretty crowded with hikers. I went there in the middle of the week to take a few photographs and ran into two local nordic walkers who said that they wouldn't even use this trail on weekends because it was too crowded. There are two special attractions the Lillach has to offer: the first one is a rare damselfly called the Two-Toothed Goldenring which prefers small creeks very rich in oxygen. Ideal hatching waters for his damselfly also hold moss partly incrusted by tufa, the second attraction. Tufa is a mineral formed by precipitation of calcium and magnesium carbonates from spring water. Years ago, I used to do entomological excursions for flyfishers in that area, nowadays great care is taken to keep anyone from stepping into the creek. This little brook always reminds me of the countryside along the Gacka River in Croatia. From 1989 to 1994 I held a part-lease on the fishing rights on the Pegnitz River near the villages Güntherstal and Lungsdorf. At that time I regularly taught at flyfishing clinics in Velden on the Pegnitz and on my way to Velden I drove by these villages. In 1989 I realized that I had never seen a flyfisher along those waters, so I contacted the person holding the lease, and we agreed on a sub-lease I held for five years. Unfortunately, at that time this stretch of water was heavily "infected" with Northern Pike. By mere chance I found out that these pike had a craving for nymphs. After practising the method for about a year, I took to demonstrating it in my flyfishing classes on the Gmundner Traun, below the Danzer weir - always a success. We have been thoroughly happy since we managed to lease the fishing rights in more than two kilometers of the Wiesent River last fall. The Wiesent is one of Europe's most famous trout and grayling fisheries, especially renowned among fly fishers for its mayfly hatches. The prices for fishing permits are mostly exorbitant and on top of that there are long waiting lists, so we have been very, very lucky. We, that is the Franconian Roundtable of Flyfishers. Well, the time for euphoria has passed, and we have to settle down and mind our annual chores. Although this winter hasn't been too hard so far, our fishery has had its share of visits from cormorants, and we have to consider which kind of a welcome would be adequate for their next visit. We just finished cutting brush (and trees), and my body keeps telling me I should do something to get in shape. Just imagine having spent several weeks practically in the wilderness, flyfishing during the daylight hours, sorting things or preparing your day at dawn, and spending your evenings shopping, cooking, eating, doing the dishes etc.. The towns you see usually have populations of less than thousand people and just about everything closes at 8 p.m.. It doesn't matter whether you've been fishing on the mainland or on Vancouver Island. Either you come from the mountains in the northeast or on the ferry from the west. I had arrived with the day's last ferry from Nanaimo on Vancouver Island, then took Highway #1, which I left on the second exit onto Scenic Drive and then to Cypress Mountain. I've been wanting to take this picture for a long time. After all this solitude, the return to civilization can be shockingly beautiful. Vancouver Island is to Western Canadians what Las Palmas is to Central Europeans. Talking about winters in Canada, one imagines icy, frozen landscapes and temperatures well below 0°F. On Vancouver Island, however, the temperatures are very moderate as a rule. Especially in coastal regions, the thermometer hardly drops below 32° F. As a rule of thumb, snow is limited to higher altitudes. Rain season would be a more accurate description of October to March in Vancouver Island than winter. Quite a few times I have had the opportunity to fish for steelhead in shirtsleeves in February. Temperatures in the high fifties are not such a big surprise at times. The rain, though, might really get you down. Sometimes the water keeps falling out of the sky for days, weeks, or even months from October through March. Precipitation of up to seven meters can fall in some years. This photograph was taken on the West Coast of Van Island in Mid-December and it shows that there are also days that look a lot better. Some of the most exciting buildings have been constructed just to lay railroad tracks. There is, e.g., the Spiral Tunnel on the railway from Vancouver to Calgary, where trains rise to a considerable altitude using relatively very little room on their way. Even the "simple" building of a railroad along a river - as seen here on the Thompson - is a hell of a challenge. To me, things get really crazy - pardon my French - when the rails are ready on one side of the river, and a competing company builds another railroad on the opposite bank. That's the case in this picture. On the left edge you can see just a bit of the road. You can't see the rails, but believe me, they're there. Just like on the right side of the picture, the railroad tracks are sometimes the only way to get to some remote areas. That's exactly what I used them for on my Canada trip in 2014. I absolutely wanted to try gold panning in one special place on the river. I walked 12 kms one way on the tracks, but be careful! The railroad companies don't appreciate that too much, and you might get fined.